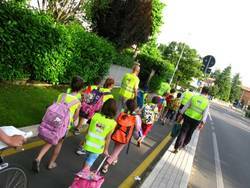 In Formigine 86 children with the support of 29 adults (parents, grandparents, volunteers), in 4 schools were contributing 17200 Miglia Verde to the ZOOM Campaign this yaer. 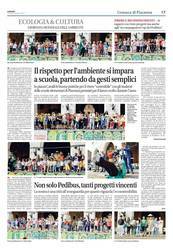 In Piacenza this year 1407 children from 13 schools collected 89,852 Miglia Verdi from March to April! On 5th of June, the World Environment Day (WED), the best classes out of 65 were awarded at a little festivity on the Piazza Cavalli. In Sacile 264 pupils from 5 primary schools collected Miglia Verde in the schoolyear 2013/14. With their Pedibus action and always carefully watched by Mr Hop, the kangaroo, they sum up to 52,800 Green Footprints just with their journeys in the morning - congratulations! This year, 59 schools with 376 classes and 5314 pupils took part and collected 66,880 Climate Steps. 35 municipalities were involved in 2014.